Home remodeling cost savings is much about planning and paying attention to details. This said, the first and foremost important thing you can do for home remodeling cost savings is to generate a detailed set of home remodeling plans and a checklist. The home remodeling plans should include all the necessary information for obtaining home remodeling contractor quotes and for pulling building permits. In addition, it should also include a detailed cost breakdown for all the various phases of the home remodeling project, including a comprehensive material lists. The home remodeling checklist should effectively map out a detailed set of plans and schedule of activities for the home remodeling project. In addition to having a good set of home remodeling plans and a checklist there are a number of other ways to obtain home remodeling cost savings, starting with personal sweat equity. Even a novice do it yourself homeowner can quickly learn to paint. And with a little bit of research, self confidence and a few basic carpentry tools there are a number of other tasks a homeowner can do to achieve meaningful home remodeling cost savings. Other skills and tasks homeowners can fairly easily pick up and do themselves include hanging closet shelving, installing baseboard, door and window trim and mounting bathroom towel and toilet paper racks. And for the more skilled or daring do it yourself homeowner tasks such as insulating and installing wood floors is even possible. All of these types of tasks can yield significant home remodeling cost savings. Besides saving labor costs you also save on the 20-50% material markups that contractors charge for ordering and getting the material delivered to your job site. Another way to achieve significant home remodeling cost savings is to use remnant flooring materials. Often carpet suppliers have remnant carpet pieces that are large enough to cover a small to medium sized bedroom. You can save dramatically by using remnant carpet as carpet dealers are more than happy to offer a major discount on it rather than scraping it all together for zero revenue. Likewise, wood flooring suppliers often have left over stock that they plan to no longer carry that you can get good deals on. When buying lumber material check with the contractors desk. 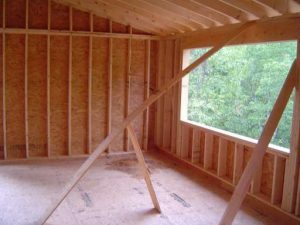 If you are planning to buy a large supply of lumber for a home construction project they may just offer you a contractor discount. Contractor discounts are often 10% or more, which can translate into significant home remodeling cost savings for you. In addition, whenever possible use local home improvement centers for ordering materials. The closer they are to your jobsite the lower the material delivery costs. For many larger home remodeling projects a general contractor is hired for doing some of the work, but also for hiring and coordinating the subcontractors. General contractor costs for just their oversight and coordination activities can add up to 25-30% of the total home remodeling budget. If you think you have the management skills and the time to hire and coordinate the subcontractors then consider cutting out the general contractor middleman for some serious home remodeling cost savings. Be forewarned though that managing subcontractors is akin to herding cats and catering to movie stars. Managing subcontractors is much about having the right personality. If your personality is a cross between a pit bull and a perfectionist than you’re probably a good fit for acting as a general contractor. Regardless if you are hiring a general contractor or going to act as your own general contractor, always carefully evaluate each home remodeling contractor bid and push back on the initial price quotes. In many cases the contractors are testing you to see how much you’re willing to pay. Also, don’t necessarily go with the lowest bid, at least not without fully understanding the materials they plan on using and conducting a thorough reference and background check first. Sometimes the lowest bid results in the least home remodeling cost savings. To conclude, with proper planning and attention to detail, some willingness to put in some personal sweat equity, and negotiating with home remodeling suppliers and contractors you can achieve significant home remodeling cost savings. If want more information on how to hire home remodeling contractors see my Home Addition Bid Sheets. Besides helping you find the best home remodeling contractor for your project, they also include an invaluable checklist tool and information on managing a home remodeling project. In addition, for larger home remodeling projects, each bid sheet includes a separate home remodeling cost breakdown spreadsheet, in Microsoft Excel format, for estimating and managing your own home remodeling costs.